About 1,000 workers agreed to an offer for higher wages and a one-time bonus, ending their monthlong work stoppage. Although the workers did not get as large a raise as they hoped, they nonetheless achieved an important goal: For the first time, the workers of a company owned by the Defense Ministry reached a collective bargaining agreement. One good thing about engineer and logistic units is that they can be put to practical use even when there's no combat or training. 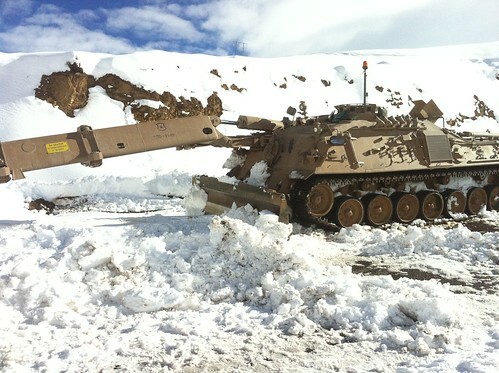 With Chile battling the "white earthquake," a devastating snowy season, army units have been busy providing aid. Earlier this month, for example, troops broke through to a town in the area of Quinquén (in the south of Chile) that had been isolated for a week. In the north, where rare snowstorms caught everyone by surprise, an army patrol marched 11 hours to rescue a bus with Bolivians that was stuck in the snow. Air force UH-1H helicopters and fixed-wing aircraft have flown in relief supplies to various communities. But every disaster exposes a shortcoming, and in this case it's the concentration of military helicopters in strategic areas, such as Punta Arenas in the extreme south, Santiago and the air bases in Antofagasta and Iquique. Helicopter units have been moved quickly, however, to trouble spots in earlier disasters. While the crime rate is down in Chile, it's been climbing in the area of Iquique, one of the largest cities west of Bolivia. In fact, it has the country's highest crime rate. A porous 365-kilometer border has made it easy for drugs to flow into Chile from Bolivia, and for stolen vehicles to enter Bolivia from Chile. Of more than 80 crossings along the border, only three are legal and have police checkpoints. Now, the government is asking Chile's army for help. The plan is to have army engineers dig trenches and other obstacles to slow the flow of traffickers and illegal aliens. Video cameras will be installed to better monitor the region. But officials are getting some pushback from the army. An unnamed representative of the joint chiefs of staff told government officials that the army's doctrine prohibits it from taking part in anti-drug operations. It's not clear if that includes digging obstacles. Indeed, the security along the border is largely the responsibility of the national police. Carabineros act as the border patrol. They now operate a King Air B200G airplane with imaging equipment to watch over the extensive desert region. They could go shopping for more equipment. Chile has acquired an extensive logistical support system for its joint peacekeeping force with Argentina. The acquisition involves dozens of containers and tents for lodging, medical care, command posts, kitchens, dining halls, laundry facilities, bathrooms, refrigeration equipment, repair shops, water purification and desalination systems, a gym and other gear to make living on the combat zone more tolerable. The mobile facilities are enough to sustain 800 personnel in just about any part of the world, says ARPA, the Spanish manufacturer. Chile's purchase includes facilities and systems to support air operations. Chile and Argentina have conduction joint exercises as they continue forming their task force. The cost of the purchase was not disclosed. Mapuche extremists broke a period of calm, mounting an attack on truckers in the south of Chile on July 8. Several hooded individuals fired shotguns and forced drivers who were sleeping inside their trucks along a road to exit their vehicles. The attackers then set fire to the four logging trucks. They also tried to attack a passing ambulance, but it managed to escape. It is presumed the attackers were Mapuche radicals, members of the indigenous people who have been waging a war of terror in hopes of reclaiming ancestral lands. The uprising -- which has tended to target logging, ranching and police in the region -- poses one of the biggest security problems for Chilean officials. The attack followed a July 1 shooting at police officers guarding a ranch that has been attacked multiple times. Meanwhile, a judge released five Mapuche activists who had been accused of murder. The navy's shipyard -- trying to get back on its feet after being wiped out in the February 2010 tsunami -- is dealing with another big problem. Workers have gone on strike, halting work at the yard for about a month now. There's been no word from Asmar on any project delays, but the strike is certainly not what the company needed. Workers are seeking higher wages. An interesting twist is that the workers' union accused the navy of using marines to halt a protest march. The way the union chief tells it, the naval zone's commander rejected a protest on the naval base's grounds and threatened to use troops if it was carried out. The union marched to the base's gates, where they were met by armed marines. The navy confirmed it denied permission for the protest, citing navy regulations. But it denies being heavy-handed.